I first discovered fanfiction at a Harry Potter Con a few years ago in San Francisco—appropriately enough. It reminded me at the time that I tend to live my life under a large literary rock. The Internet is full of fanfiction sites. If you are unaware of fanfic, then tread carefully, especially if you are checking out fanfic sites of your favourite series. I only ever read fanfic occasionally, but as someone who encourages reading, writing, and writing about reading, I can hardly criticize such endeavours. Popular culture reproduces and responds to books and films in many ways, but the cultural response to and definition of what have come to be called children’s classics emerges, in part, from nostalgic adults who are attached to their reading experiences of such books. But when is fanfic no longer fanfic? If you are a published author, then it’s called a sequel—apparently. Earlier this year a colleague recommended to me William Horwood’s Tales of the Willows series. These books were published in the 90s. But don’t give me too hard a time for not knowing about them earlier. Remember, I live under a rock. 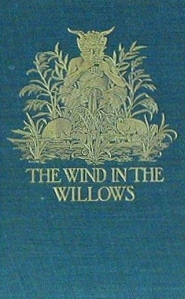 The Willows in Winter, Toad Triumphant, The Willows and Beyond, and The Willows at Christmas are four short books by William Horwood, who, as you might guess, picks up the story of Mole, Rat, Badger, Toad, and Otter from Kenneth Grahame’s The Wind in the Willows. The Wind in the Willows found its way onto my literary landscape early in my reading life. I remember my mother reading it out loud to me, and I read it later again and again. I’ve even taught the book a couple of times. Teaching the book to a children’s literature class, however, can get problematic. For one, the book has no sympathetic female characters, and the River Bank itself is populated only by males. As my children’s literature classes are mostly female students, you can guess the response. Fortunately for me, my classes are filled with bright students, who are both critical and forgiving readers, so we talk about it, and no one trashes the book. Teaching Tolkien’s The Hobbit presents me with the same problem—no female characters. I got used to identifying the fact right away, so no one is stewing over it while I gush about the book. Back to Horwood. When an author picks up a story and creates his or her own, I never quite know what to do with it. But that’s just me. If you are looking for further adventures with Mole, Rat, and the rest, then you won’t be disappointed. Horwood works hard to remain true to Grahame’s style, and the various adventures of toad are as whacky and thoughtless as in the original book. I read The Willows and Beyond first, which may have been a mistake. This book introduces the next generation—as it were—and it sees the return of such characters as the Sea Rat. But the paradise of the River Bank has become infected, which leads to (spoiler alert here) the dissolution of this particular utopia. Goodbye golden age. I loved the adventures of Toad, but I think even more I loved the insular nature of the River Bank. It was a place set apart—safe and yet full of manageable danger and adventure. It was a place that spoke to me of home, of friendship, and days without end. Rat and Mole in fact visit the Wide World during their adventures with toad, but that never took away from my sense of the River Bank as a world set apart. Perhaps this is my own nostalgia in operation, but I don’t care. If you don’t want anyone, not even an author, messing with your books and the worlds you hold dear, then I would avoid fanfic and writers such as Horwood. But if you want more of the world of the willows and the River Bank, then check out these books. They aren’t long, so get them all, find a quiet place, and feast on these new adventures with familiar characters.